By Aragon Garcia: Famous American promoter Bob Arum says Saul Canelo Alvarez is now the best middleweight in boxing today, and has surpassed Gennady Golovkin, who is getting old and the guy he was before. Canelo is unbeatable says Top Rank boss Arum, who sees him as having risen to the top of the 160 lb weight class. It’s a big compliment that Arum gives Canelo by putting him at #1 at middleweight, seeing as he also promotes WBA ‘regular’ middleweight champion Rob Brant, one of the best fighters in the 160 lb weight class. “There is not a boxer who can beat Canelo today, Golovkin would have chosen him last year, but he is getting old and Canelo is the best middleweight in the world and there is no one who can beat him,” Arum said to ESPN Deportes. Canelo was seen as the #2 middleweight going into his rematch with WBA/WBC middleweight champion GGG (38-1-1, 34 KOs), but he beat him in a one-sided manner through the first nine rounds, and then held on in the championship rounds when the Kazakh rallied. It was too little too late for Golovkin, and he was forced to taste defeat for the first and possibly not the last time at the hands of the talented Canelo Alvarez. The scores were in Canelo’s favor 115-113, 115-113, and 114-114. Boxing News 24 scored it for Canelo 115-113. IBF champion Danny Jacobs will get a chance to show that he’s better than Canelo when they fight each other on May 4 on DAZN at the T-Mobile Arena in Las Vegas, Nevada. 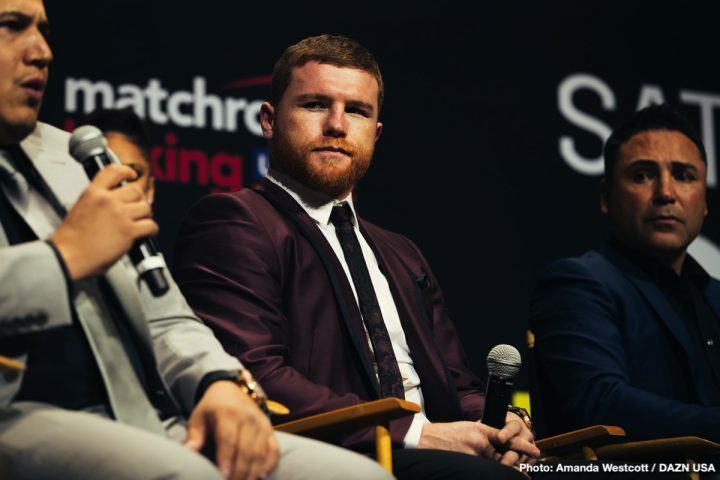 The trouble with Canelo being the best middleweight in the world is that he’s going to need to continue to prove it against the best for him to keep that status. Arum sees Jacobs, 32, as the #2 fighter in the middleweight division, and Golovkin behind him at #3. Golovkin will get a shot at avenging his loss to Canelo when they fight each other next September on DAZN. It goes without saying that Canelo will be the favorite in the fight. If GGG, 36, can’t make the adjustments in his game, he’ll lose for a third time to Canelo, and it’ll be bad for him. Arum says Jacobs won’t be able to beat Canelo because he’s catching him at the wrong time in his career. Had the Brooklyn, New York native Jacobs caught Canelo two years ago, he would have beaten him, according to Arum, but not now. “It’s a good fight,” Arum said of the Canelo vs. Jacobs fight on May 4 on DAZN. “Jacobs is a good middleweight. If he had fought with Canelo a year or two ago, he would have had more opportunity, but Canelo is getting to the top of his abilities. He’s a good fighter and I think Canelo will be too much,” Arum said. Jacobs’ ability to take head shots will be his undoing against Canelo. To beat Canelo, Jacobs would need to be able to handle his his best punches upstairs, but unfortunately for Danny, he can’t take head shots without staggering and getting hurt when he fighting bigger punchers. Jacobs’ fought like he was walking on egg shells in his loss to Golovkin in 2017. Jacobs didn’t look courageous in that fight, and it cost him when it came to the judges’ scoring. When Jacobs lost to Dmitry Pirog in 2010, he was on his bike, trying to get away from the Russian fighter. Pirog stalked Jacobs around the ring until he knocked him out in the fifth round. Canelo Alvarez was in the audience that night to see Jacobs get knocked out by Pirog. Despite Arum saying Canelo is the #1 middleweight in boxing, he rates his own fighters WBA/WBO lightweight champion Vasiliy Lomachenko (12-1, 9 KOs) and WBO welterweight champion Terence ‘Bud’ Crawford (34-0, 25 KOs) ahead of Canelo in the pound-for-pound rating. “Canelo is not the best, I know I’m in a Hispanic program but I like the skills, there’s Vasyl Lomachenko who fights on April 12 at Staples with Anthony Crolla and Terence Crawford who reminds me of Sugar Ray Leonard and fights Amir Khan,” Arum said. Having seen Sugar Ray fight on Youtube many times, this writer cannot see what Arum is talking about when he compares Crawford to boxing great Leonard. The two are nowhere near the same type of fighters. Leonard threw flurries, and was fast of hand and foot. Crawford is more of a switch-hitting slickster, who moves a lot, jabs and wins by counter punching. Leonard was arguably way more exciting to watch in his prime than Crawford. Arum would have been better off comparing Crawford to Donald Curry. Even that comparison is a bad one, but it’s closer to what the way Crawford fights than comparing him to Leonard. Canelo has fought the better competition than both Lomachenko and Crawford, and has better wins than the two. It’s understandable why Arum would pick his own Top Rank fighters over Canelo in the pound-for-pound rankings, but in real terms, it’s hard to see either of those two guys being ahead of Canelo.